If you want a romantic getaway in a stunning setting, Crater Lake National Park would be my suggestion. 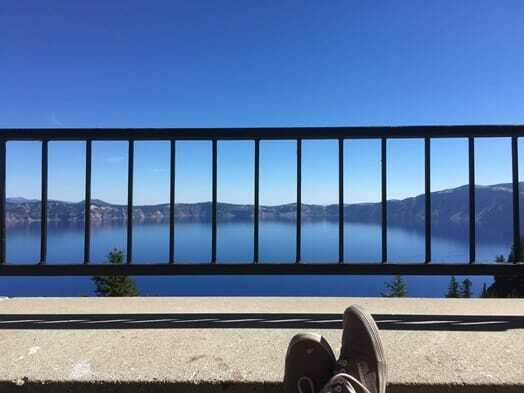 Even though I was camping in the park this month, I decided to treat myself to a little bit of luxury and Crater Lake certainly offers the best of it. Crater Lake National Park is in southern Oregon, in the Cascade Mountains. Its namesake isn’t actually a crater, rather it’s a caldera. 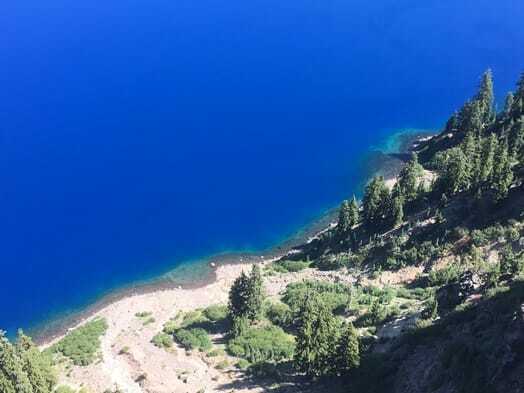 A caldera is the depression left by a collapsed volcano and Crater Lake’s Mount Mazama is thought to have lost 2,500 to 3,500 feet in height around 5700 BC. In the following 700 years, the lake slowly filled in with fresh rainwater and snowmelt. I visited Crater Lake for four days and that was just the right amount of time. I stayed in the Mazama Campground, which has generously sized campsites. I had two experiences with animals there. One night, a fellow camper asked if I’d lost a cat! I said no, but they had found a stray which wandered into their campsite. Just a night later, I heard a large animal walking around my campsite late at night. The next day, rumor circulated that a mountain lion had been spotted in the campground. I wasn’t as concerned for myself as I was for that stray cat! I did a little bit of hiking – walking actually – in the park, but quickly settled into a luxurious routine. I alternated between breakfast at my campsite and breakfast at the nearby Annie Creek Restaurant. The breakfasts there were good, but I would much more highly recommend the buffalo burgers for lunch or dinner. There are also a few (very few) electrical outlets in this restaurant, but many times I yielded to the Pacific Crest Trail thru-hikers who, I felt, needed the electricity more than I did. The wifi throughout the park is decent, but free for only an hour each day. It’s worth it to upgrade and buy a day’s worth of wifi, since there isn’t cell phone coverage in the park. Later in the day, I would often drive to the Rim Village Café. I’d skip their food – way too pricey – but do head upstairs. There’s a large loft, often empty, but with plenty of tables and chairs, plug-ins, and decent wifi. Also, at the far end there are rocking chairs with large windows overlooking Crater Lake. This loft seemed to be a hidden gem in the park. Not many people ventured up the stairs and the ones that did didn’t stay long. It felt a little bit off-limits since not many people were up there, but I don’t think it was actually closed. It was up in this loft that, after I’d completed some work for a client, I headed over to the rocking chairs by the big windows. For that moment, I had the entire space to myself. And then a saxophonist began to play outside. I felt serenaded and I smiled at the simple pleasures life sometimes threw my way. Much closer to Crater Lake is the Crater Lake Lodge. This facility offers lodging, restaurant dining, drink/dessert/appetizer service in the lobby/lounge and, best of all, a patio overlooking the lake. On one afternoon, I decided to just camp out here and treat myself. I’d been doing a significant amount of journaling to sort out some goals and plans and this felt like an extended opportunity to reflect. So, I worked at a window on my laptop for a little while with a latte. Then I ordered a glass of wine and headed out to the patio. This is a popular spot, but eventually a front-row rocking chair became available. I enjoyed the glass of wine, with my feet propped up on the stone wall and gazed out at the blue wonder. Eventually, I headed back inside and re-planted myself in the lobby (which feels more like a large lounge, complete with a large fireplace). 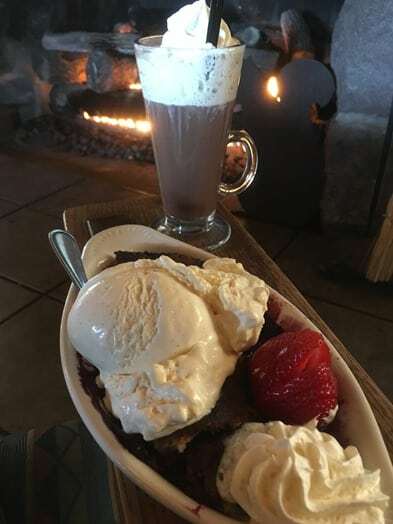 I ordered a triple berry cobbler (layers of blackberry, raspberry and marionberry) topped with huckleberry ice cream and a spiked hot chocolate. This was entirely too decadent…but I enjoyed every second of it! While gingerly chipping away at these desserts, a Ranger came in and began a program. He told an interesting history of the Klamath people, which included a battle between two Chiefs, one of the underworld and another of the upper. A woman was involved, of course, plus a heavy dose of jealousy, power, embarrassment, and rage and…somehow the mountain explodes/erupts and all comes crashing in. All these treats combined to make this feel like a very luxurious and even romantic visit to the park, even though I was flying solo. The scenic drive around the rim of Crater Lake was beautiful. Pull off every chance you get – you just don’t see blue lakes like this anywhere else. While I was visiting, extensive construction was happening on the roads, making it a very dusty and bumpy ride for long segments. Hopefully that clears up soon. There are also boat tours available and I sincerely regret not taking one. I’m not sure what I was thinking. I was in a contemplative mode, then a luxurious, treat-myself mode and just didn’t add this to my itinerary. Next time I will. 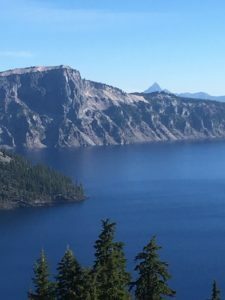 I’ll add this too: I applaud the Crater Lake National Park administration for their 22-minute park film. And here’s why: Most national park films begin with the natural element which formed the region (usually water) and/or the man who supposedly discovered the region or natural feature. After exploring both elements, the film then gets to the development of the area as a natural park, usually after exploitative tourist activity really threatens to wreck it. Then, and only then, do most national park films loop back to the Native Americans who lived in the area before a white man “discovered” the beauty and worked to exploit or protect it. 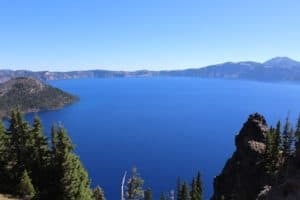 The Crater Lake video, though, starts with the Native American tribe from the area, the Klamath people, and the natural event which formed the caldera. I was so pleased with this! All national park videos should be in a more accurate chronological order. 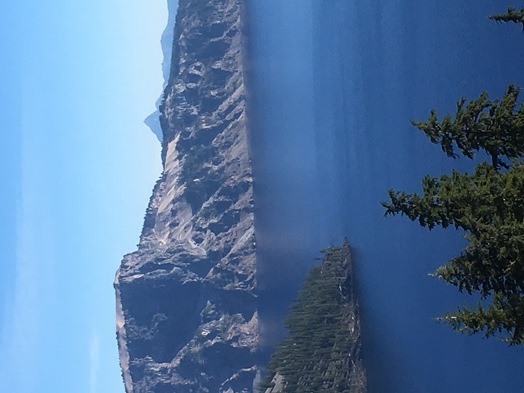 So, there are many reasons to visit Crater Lake National Park. I even saved, inadvertently, much of the hiking and the boat tour for my next visit. The Lodge patio and desserts, the Café loft and sax serenade, the generous campsites, and the burgers at Annie’s enhanced the daily, crystal clear view of that big beautiful lake. Where a mountain once stood, we marvel at what is no longer there.